The Bote Rover is designed with a deep V at its nose. This makes it easier to slice through water in any condition. The ability to punch through waves allows the operator to get further faster without as much intense paddling. The superior maneuverability also makes it easier to focus on reeling in a big fish without worrying that your board will get blown too far off course. The Rover’s flexibility is thanks to its easily modifiable Rac Receiver System. There are no special tools required, and all you have to do is slide the Rac you want into the receiver. The Moto Rac is included with the initial purchase of the Rover, and other Racs can be added separately. Additional Racs include the Grab Rac, Bucket Rac, and Tackle Rac. Each Rac offers unique benefits and fits a specific purpose, but the Moto Rac is what makes the Bote Rover really special. It gives it unparalleled speed and lets you go farther by turning the paddle board into a tiny skiff by adding motor power. The Moto Rac only weighs four pounds and is made from marine grade aluminum. It also contains two slotted fishing rod holders and two one gallon Rotopax mounts. In addition to the Rac Receiver, system, it also enables connectivity for your other devices. Use the ConnexSUP plugs to integrate your fish finder, cooler, cameras, and anything else. The sunken cockpit gives the Rover a low center of gravity, which makes it Bote’s most stable product ever. The 500-pound capacity can handle just about anything. The Bote Rover is one of the best fishing tools since hooks and rods. 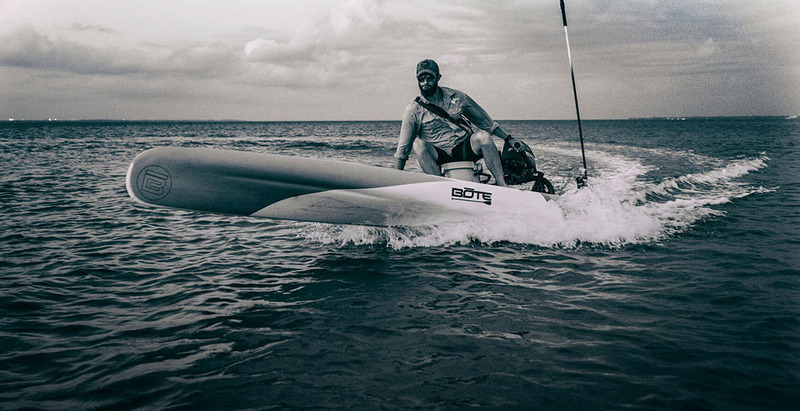 Nautical Ventures is your go-to Bote Rover dealer when you need a Bote Rover for sale in Palm Beach, Broward Beaches, or the surrounding area. Visit us at any of our locations today to learn more and get your very own Bote Rover.